STS Digitiser is a CADKEY application program that brings 3D digitized data directly into CADKEY in real time. Entities created automatically in CADKEY include points, lines, arcs, splines and polylines. Using CADKEY and FastSURF this data can be used to create splines, surfaces, 3D wireframe models and solids. All data created is usable for CNC machining or rapid prototyping, including STL, LOM, PDM, Etc. 1. Capturing points in 3D space using FARO arm and STS Digitiser. 3. 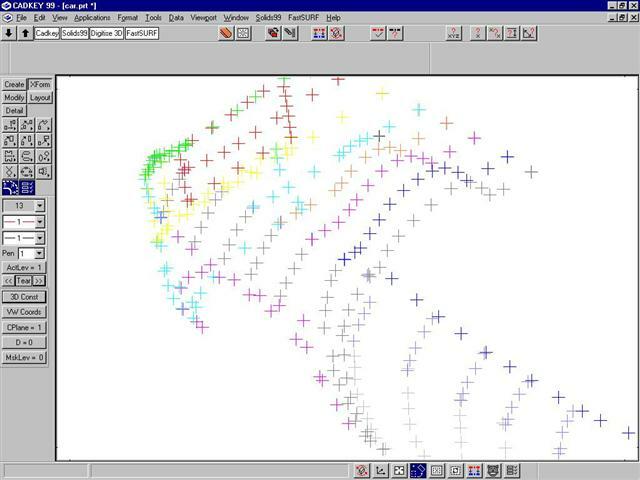 Create splines through points. 4. Create Surfaces through splines. 7. NC Machine full sized mock-up in H.D. Foam or other suitable material. Same process for Fibreglass plug. All work on this project was done using Cadkey/ KeyCreator Surfaces, and KeyMachinist. Smoothing splines and regenerating surfaces will take some time, but the more care and attention you give to these processes the better the final surfaces will be. Surfacing of the finished splines was completed using FastSURF. Modifications to the shape and size of the model can be made at anytime. You could produce a quick render of your surfaces to check the smoothness and quality of surfaces at various intervals. 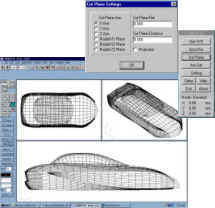 When finished modelling the CAD data was scaled up by 5:1 to achieve the full size car body. Then NC-MATIC 19 was used to produce the tool paths and machine the full size mock-up in HD Foam.